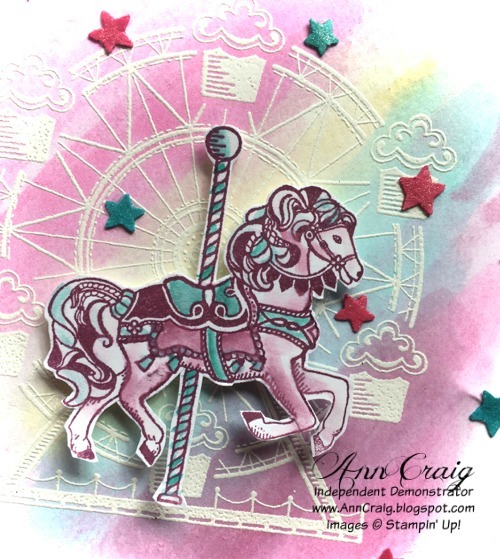 The Carousel Birthday stamp set from Stampin' Up! has such pretty images that are finely detailed, and stamp beautifully onto the cardstock. 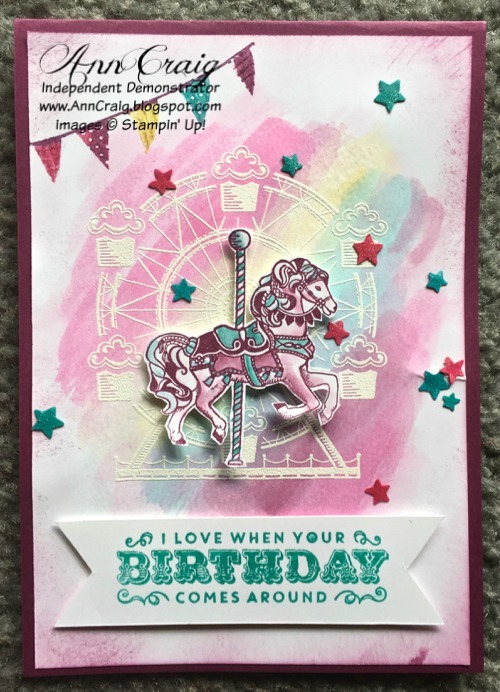 Today's class did a colourful version of the card and we started by white embossing the carousel image onto Whisper White card. It would make a nice effect to use either water colour paper or Shimmery White for the base too. We made a colourful background using Classic inks and the Aqua Painter, laying the colour over the top of the embossed carousel. We used Rich Razzleberry, Melon Mambo, Daffodil Delight, and Bermuda Bay inks,and had to be careful not to get the paper too wet. We stamped the horse in Rich Razzleberry, fussy cut it out and painted in details and a little shading, before adhering to the card base with dimensionals. The finished card has a greeting from the Carousel Birthday stamp set, plus some flags from the Celebrate Today stamp set from the Annual Catalogue. I love how you can straighten out the swag of the flag when using photopolymer stamps. These flags were hand coloured using the Stampin Write Markers so we could get multi colours at the one time. A few stars were added (cut from the Confetti Stars Border Punch) and then Clear Wink of Stella was applied to the stars, the flags and parts of the horse. This was a fun card to make and I think I will keep it for my littlest grand daughter who turns 1 in a couple of weeks.